it takes a load off my shoulders"
Early on, NCPIC saw the value of providing images with reports to referring physicians and patients. "We've been using a Codonics imager since we opened our doors in 1992," says Bruce Finley, PET Tech Supervisor, NCPIC. "We were so pleased with the original imager that we replaced it with the latest generation Horizon imager in November 2003 in conjunction with our new PET/CT system." According to Steven Falen, MD, PhD, Medical Director, NCPIC, highlighting principle findings by printing key images from the PET/CT scan provides greater value because, "it is often difficult to verbally describe the shape of a lesion or the relationship of the lesion to a vessel, adjacent organ or other important anatomy," he says. Yet, today's advanced imaging equipment, particularly hybrid imaging systems like PET and multi-slice CT (MDCT), generate large data sets that are then post-processed into three-dimensional (3D) images. "It is very difficult to demonstrate 3D anatomy in 2D printed form," says Dr. Falen. 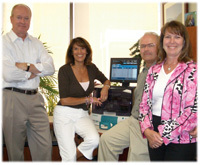 NCPIC realized that a CD disc publishing solution was a necessary component for distributing images to clinicians. While NCPIC recognized the value of CD disc publishing, appropriate PET/ CT viewing software was limited. In 2007, Finley researched the Codonics Virtua XR Medical Disc Publisher and learned that the company was developing a complete nuclear medicine and PET/CT viewer solution. In August 2008, they installed Virtua XR and the product's capabilities were immediately apparent to the staff. Each Virtua disc includes all DICOM header information and the appropriate software to facilitate viewing from the disc. Jan Cronin, Market Development Manager, NCPIC, explains, "We have found that the referring physicians – and particularly the surgeons – really use the CD to analyze the lesion structure and details prior to surgery." She has heard from some radiation and medical oncologists that they are importing NCPIC's images from the Virtua disc directly into their treatment planning systems. Dr. Falen believes that having 3D and fused images on the disc does help the surgeons and oncologists. "With PET/CT, the image fusion occurs within the software, so having a disc with viewing software and a complete data set is more valuable than a printed copy," says Dr. Falen. Virtua includes a full-featured viewer for fused images on each disc. "This is not an insignificant program, it is rather impressive," he adds. In fact, Dr. Falen attributes fewer phone call interruptions as a result of the referring physicians' ability to clearly visualize lesions using the software on the disc. Since each disc can be customized, Virtua's flexibility is apparent to Finley. "We can choose different DICOM viewing software based upon its ability to adequately handle the image characteristics of each modality," he says. Codonics offers several in-house DICOM viewers, including specialized viewers such as the PET/CT Siemens syngo® Media Viewer that NCPIC uses, as well as several from other manufacturers. "This flexibility and collaboration adds a lot of value to Virtua," adds Finley. "Choice of viewing software is essential for the device to reach its full potential." For Dr. Falen, that flexibility also allows him to easily review PET/CT cases with referring physicians, a task that is particularly important for his presentations at tumor boards. Yet, the system is very user-friendly, particularly with its web-based interface. From virtually any location throughout the facility, staff can send a request to burn a CD. "Our effort is minimal. Virtua is simply another destination," adds Finley. Plus, Virtua provides another lower cost, HIPAA-compliant and redundant archive solution; NCPIC just makes two discs instead of one. According to Jeanette Galvan, Administrative Coordinator, NCPIC, the center was manually duplicating data and printing discs for each patient on another system prior to Virtua. "Before, it took two hours of my day to print and label each disc, and the process was extremely error prone." Today, this same process takes her less than 45 minutes, saving Galvan six hours each week. Since the process is automatic with information populated directly from the modality workstation, Galvan knows the discs are complete and accurate. Ease of use does translate to cost savings. "We've saved 0.5 FTE in the front office and 0.2 FTE for our technologists," Galvan explains, for a total reduction in salary expense of approximately $36,000. NCPIC also realizes lower costs for mailing and media. A disc is more cost effective than thermal paper, plus multiple studies can be saved on one disc. "Virtua has made my job easier and because it is so accurate, it takes a load off my shoulders," she says. The system keeps NCPIC informed of status and potential problems, even at remote locations. "Virtua is truly good for workflow: it doesn't make mistakes and takes the information right from the DICOM header," Finley says. "This allows us to make new or duplicate discs on demand." Plus, Virtua offers a custom label capability so NCPIC can easily add its full color logo, phone and address to each disc, providing another vehicle that supplements Cronin's marketing efforts. Adds Cronin, "as our referral base grows, and we add new modalities, the flexibility and marketing benefits of Virtua will only continue to help us." The staff at NCPIC knows first hand the ability to share patient images with referring physicians and specialists, by either printing on Codonics Horizon Multi-media Imager or burning a disc on the Virtua Medical Disc Publisher, enhances the patient care process and simultaneously builds loyalty among a wide-ranging referral base. As Dr. Falen says, "An image is worth a thousand words." This model/configuration of Virtua is no longer available for purchase or use in the United States.